The way we dress reflects how much we respect the host and the dignity of the event. That is why, for example, that we present ourselves well dressed to a job interview, a gala banquet, a wedding or a funeral. If the believers understood the sublime meaning of visiting the house of God, they would manifest the greatest respect in the way they dress. I understand the sin that is judging people by their appearance. Santiago teaches us well: Suppose a man with a gold ring and a splendid dress enters your assembly; and a poor man also enters with a dirty garment; and that we turn our gaze to the one who wears the splendid dress and we say: "You, sit here, in a good place"; On the other hand, we say to the poor person: "You, stand there," or "Sit at my feet." Would not this make distinctions between you and be judges with bad criteria? -Santiago 2,2-4. Certainly we should not judge. The person in dirty clothes may be poor, may have left work and it is their only opportunity to attend church. He may come with great personal problems and is not thinking about how he dresses. In short, there are many reasons and should not be judged. Even if we are poor, we bring the best we have. If we do not wear the best clothes for the church, for whom do we reserve it? Remember that not only speaks with words but also with the language of our external attitudes. That is why Jesus teaches us in the Gospel of St. Matthew: "The king entered to see the guests, and when he noticed that there was one who did not have a wedding suit, he said:" Friend, how did you come here without wedding dress?" He remained silent. Then the king said to the servants, "Bind him hand and foot, and cast him into the outer darkness, there shall be weeping and gnashing of teeth." -Matthew 22, 11-13 Obviously it is not a poor person who had nothing else to wear, it is a lack of respect that can not be justified. If we are going to visit the Palace of the Presidency and have an appointment with His Excellency President, obviously we will not present ourselves there with shorts, sleeveless dresses (there are state institutions where they do not allow us to enter with this type of clothing) or provocative necklines . We do not advocate either for making clothes the center of attention; but today we have gone to the other extreme and forgotten to dress respectfully if it has its importance. That is why at RetailWomensSuits, we attend to the needs of clothing and style of the clients that seek to differentiate themselves from the crowd during any church event. Our extensive catalog includes women's clothing, men's clothing and accessories for the church. While it is true, current trends do not favor at all to the practice of the same, this should not be an excuse or justification to forget them and think that we can now dress as we see, that is, without respecting parameters or limitations that these virtues mark. Both the clothing for men and women has changed a lot over the years. In the church it used to go very elegantly, but more and more churches are seeing parishioners who dress informally. Below are some tips on how to dress for the church without looking too casual. Wear clothing, if the church still has the tradition of dressing elegantly. Most Catholic churches are a bit more elegant than others, so get ready with a skirt, dress with hat or dress pants for women's clothes if you attend a church. For men, you should wear a jacket and dress pants or a suit, this only applies to churches with strict traditions. Dress up casual wearing comfortable shoes, keeping a clean and tidy look. Casual clothing does not have to mean tennis and pants. You can wear loafers that are as comfortable as sports shoes. Trousers in neutral color and a button-down shirt is a nice and informal look for the dress in men. Women who want to dress casually can wear a simple dress and continue to respect the congregation that accumulates in the church. One of the styles that has given more talk in recent years is the fashion of the church. This fashion is known for its sophistication, elegance and good taste, as well as being a versatile and practical fashion. A fashion that is opposed to excess and provocation. This tendency was born with the purpose that the women of the community that go to the church had a style of simple clothes to use both inside and outside the churches. This style is special for all women who want to look elegant and delicate, while still looking beautiful and stylish. If you are a woman who likes classic and good taste then this is for you! Dare to enjoy the style and surprise everyone with the elegance that this trend offers. This fashion combines modern pieces with demure touches that elevate elegance and feminine figure. As we mentioned, the intention is that, those who wear this style, look elegant, delicate and very modern, presents the versatility of simple clothes but very elegant and appropriate. It is time for changes, therefore, they are being left behind at this time, the old skirts long to the ankle, wide blouses and without style. Today, women are wearing fashionable clothes, thanks to a new market that insisted on serving women who prefer a more elegant, classic and sophisticated clothing. While the pioneers are the women of Brazil, the trend has spread throughout the continent, reaching the different countries of Latin America, the news reaching portals of the world, where both the followers of this religion and the No, they give their opinion about the new style that has become furor. Church fashion has grown in tandem with the rise of women who have decided to express their faith, whether Christian, Catholic or evangelical, as well as women who believe that fashion is not just provocation. Deciding to set trends using clothes with this style. "You do not need excessive necklines or miniskirts to look elegant and attractive." "Comply with the precepts of our religion, because if you go to church to worship God, you can not go with a super cleavage." In the fashion of church mainly pastels and clear colors are used, but strong or alternative colors can be used whenever they are not very showy or garish. You should always opt for simple clothes like dresses, skirts and pants with a good "fit" but not tight or provocative. Let's think of a classic look, with good taste as well as practical. • Skirts: Hood or tube type but up to the knee. They can be from simple to flying and floral prints. • Blouses: With demure cuts, sleeves and beautiful embroidery. With or without sleeves this depends on the taste of each woman. • Accessories: Singles, bracelets, hats or purses. • Shoes: It is very much combined with high-heeled shoes. You can also use slippers and sandals with rhinestones and small ornaments. RetailWomensSuits has been so successful that you can already get them, party dresses, and special occasions. In addition to clothing to go to work and for young girls. In the case of girls and adolescents, they prefer prints and vibrant colors. However, the main thing should not be left out: the decorum, elegance and style that the church represents. On the other hand men, when visiting the church should wear, like women, in an elegant, sophisticated manner, and with a touch of horsemanship. At RetailWomensSuits we offer from elegant outfits, hats, shirts, and shoes. For information and curious data, it is interesting to know that in the official photo of the presentation of the new exhibition of the Metropolitan Museum, "Heavenly Bodies: Fashion and the Catholic Imagination" there was an unusual meeting. Donatella Versace, whose collections at the head of the Italian house have used crucifixes and religious elements as complements to the brand's sexual spirit, posed with Anna Wintour, known for having made fashion and fashion a way of life, and for her On the other hand, Cardinal Gianfranco Ravasi, president of the Pontifical Council for Culture, who looked at the cameras with a gesture of circumstance. Anna Wintour, an ally of an institution that preaches material austerity? The Vatican blessing a red carpet that would scandalize most of its senior members? The Met's decision to devote its annual show to the influence of Catholicism on the catwalks has provoked disappointment and fascination in equal parts. "Risky" is the most used qualifier to describe the state of doubt that accompanies this year's event. "Fashion and religion have been intertwined for a long time, inspiring and shaping each other," said Andrew Bolton, the curator in charge of the Costume Institute, the institution that leads this initiative. "Although this relationship has been complex and sometimes contested, it has produced some of the most inventive and innovative creations in the history of fashion." In fact, the relationship between fashion and the Church throughout history has not been entirely easy. From Corinthian texts to condemnations against Madonna's actions, the Church, almost from the beginning, has focused a large part of her work on deciding and censuring how women should dress (but rarely men). "A dress can not be called decent if it has a cleavage greater than two fingers below the concavity of the neck, if it does not cover the arms at least up to the elbow, and is cut above the knee," said Padre Pio XI , the pontiff who led the fight against impure clothes at the beginning of the century with a degree of detail that the coach of Masters of Sewing would already want. "The transparent fabric is inappropriate, unless it has a lining underneath," he continued in one of his 1928 texts, "that parents keep their daughters away from public gymnastic games and competitions, but if their daughters are forced to attend these exhibitions, to observe that they are dressed totally and in a modest way, that they never allow their daughters to wear immodest clothing ". Most of the indications the Church made about the female wardrobe were based on the idea that women were intrinsically impure and that their appearance could easily corrupt the male gender. "Pio XI thought that women's clothing was seductive and threatening to unsuspecting souls," explains Sara Dwyer-McNulty, author of "Common Threads: A Cultural History of Clothing in American Catholicism," to Vanity Fair. "Pio XI devoted special attention to the wedding dresses in the debates about the lack of modesty, because the women, when getting married, were on the altar, in a sanctuary, and there could be no sign of lack of modesty before the priest" , continues the expert. This vision, explains the theologian Isabel Mariscal, has roots much further back. "Already in the first letters of St. Paul it was indicated that women had to enter the Church modestly," he tells by telephone. Throughout the twentieth century there were several movements that focused attention on the wardrobe of women as an indicator of decency. "In the thirties there were prominent archbishops who examined the dances of the schools, where the women wore, according to them, modest clothes, and one of them, in Chicago, created a League of Modesty. Cardinal Dennis Dougherty in Philadelphia was very concerned about the Catholics who went to the movies and saw the images of the actresses that were being released at that time, "says Dwyer-McNulty," and in 1944 the Crusade of Purity was created, created by a priest from Illinois. " In the fifties the same phenomenon occurred in the twenties, the explosion of fashion and ready-to-wear, which again caused the consternation of the clergy. "Women had more resources to buy clothes, and the Church went back to clothing, and it was recommended that stores put labels on garments so that women would know what was appropriate, something that happened in New York and Missouri, between other places, "explains the historian. In that decade, modest clothing parades became popular, and several brands emerged that encouraged these ideals. "Then the Catholic Action movement appeared, which handled women's clothing in an exaggerated way," adds Mariscal. "Summer was coming and the short sleeve could not come up on the elbow, you could not take off the stockings, no flashy dresses, all very simple, this group of believers closer to the Church were the ones who imposed fashion, in quotation marks." The bikini, of course, was forbidden. Padre Pio XII went down in history for many reasons, but in the debate that concerns us today, his name appears related to the Miss World 1951 contest for publicly condemning the winner of that year, the swedish Kerstin Håkansson, first in wearing this bathing garment when collecting the prize. "How many young women do not see anything wrong in following as sheep certain shameless fashions." They would blush with embarrassment if they knew the impression they give and the feelings they arouse in those who observe them, " said Pio XII, who in 1957 delivered a speech entitled "The moral problems of fashion design." The designers also did not get rid of the censor eye. "The priests not only talked about the temptation that materialism and vanity exerted on women, but also pointed out that they were actually the victims of the designers, who were often those who offered immodest fashion and did not give more options" explains the historian. That bonfire of the vanities of 1497, when the followers of the monk Girolamo Savonarola burned objects that they considered to promote vanity, such as make-up or refined dresses, saw their continuation in the sixties and the burning of patriarchal symbols during the feminist struggle. The Second Vatican Council brought a certain modernity to the liturgy and with it also to the feminine dresscode. The women no longer had to wear a veil in mass, although in practice some continue to do so and the tradition is maintained in the audience with the pontiff. Despite their well-known body celebration, Katy Perry and Melania Trump transformed themselves into penitent widows with lace headdresses and black plumeti to receive Pope Francis. Today, that the Church debates about women's clothing has become a bit obsolete. "You do not pay much attention because it's a bit controversial," says Dwyer-McNulty. "I think the Church is more focused on addressing young people who do not feel connected to them, especially in relation to issues of sexuality, etc. Fashion does not reach the level of importance when there are these other issues in the foreground "
The defense for the "purity" of the closet survives in certain communities and in countless online Catholic publications. In "Leggings: the opinion of a Catholic man", an article on the Life Teen website for devoted teenagers, a young man explains why a girl should not wear this garment as a substitute for trousers ("dressing modestly helps you to protect yourself from be treated as the sum of the parts of your body instead of the whole person you are, "he concludes). On the other hand, the analysis of "Ask a priest: are pants appropriate for women? ", Reflects the criticism that many Catholics made of the pants because they considered them masculine and harmful against femininity. Other articles respond if Catholic women can dress sensually, if tattoos are allowed (Padre Francisco has said yes, like this YouTuber parish priest), and if crucifixes serve as fashion accessory (no). "In the eighties, when Madonna wore crucifixes and sang 'Like a virgin', making references to the Catholic church and with that type of dance, it was a shock," recalls the expert. "But today, after revealing the scandal of sexual abuse within the Church, they are rethinking how moderators of morality can be when they first have to look at themselves." Cardinal Ravasi was one of the guests at the Met gala, which was also attended by Rihanna as hostess. After having read all these controversial news, we return to the initial point, keep looking at the RetailWomensSuits catalog, you will not regret it, I assure you ..
From the comfort of your home, you can review the section of women, men, accessories, add to cart, compare prices .. Do not think more, buy now! Although the fashion of the church is not so famous, you will be delighted with everything that this web portal offers you, for a wedding, baptism or any other important event in general ... since In RetailWomensSuits, find the latest designer clothing and accessories that meet the ecclesiastical style needs of men and women at affordable prices. We deliver what you are looking for. 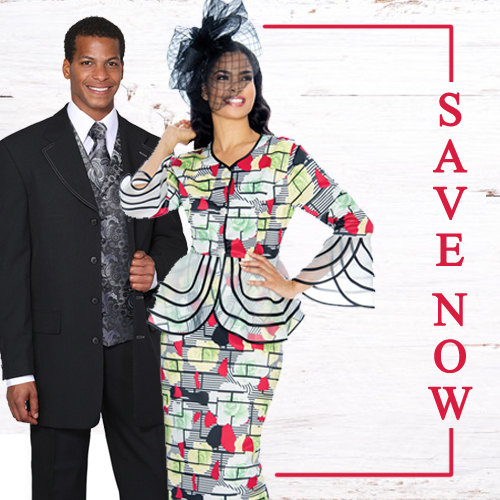 For more information on dress availability, contact us today or browse our online catalog at RetailWomensSuits., where you will find, church hats, church costumes, church dresses, shoes, accessories and much more ..